Do you go to the orchard for apple picking in the fall? I haven't been yet, but it's definitely on my fall bucket list this year. I tend to focus on other fruits throughout the rest of the year, but I do love incorporating apples into as many recipes as I can this time of year. In the autumn when everyone is all about pumpkin spice this, pumpkin spice that, I'm all about everything apple flavor. Jason had a day off last week, so I thought I'd be the good little wife and treat him to a warm breakfast. He's got a thing for bagels right now and I have a thing for quick and easy, so this Warm Apple Cream Cheese Bagel recipe from Golden Blossom Honey was just the ticket to a perfect fall breakfast, earning me major wifey brownie points without having to put forth too much effort in the process. 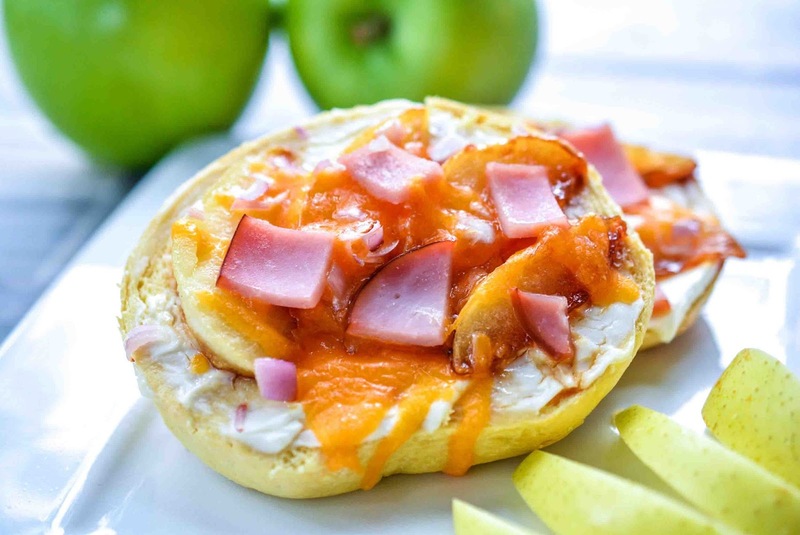 A sweet and savory dish, these bagels will really start a crisp morning off on the right foot. What's your favorite way to use apples in your fall dishes? Oooo he's such a lucky man!!! And you're such a good wife :) Have a great weekend dear! So lovely hearing Jason had a day off! He deserves a little break! In other news, I'd eat the bagels, but not with apples and bacon :) Do you have scallions all year around? We have them only in spring. We can usually get most produce year round, but we pay out the nose for out of season items. That's one reason why I am so sad to see summer end. They really jack up the prices of strawberries, blueberries and peaches, which I use a lot of all year. I wish I had more freezer space so I could buy them super cheap then freeze to use in the winter months when they aren't on sale. our old one broke recently and my mother bought an upright one that uses much less space, it is kinda like a regular fridge with upright shelves, but it freezes things. I haven't seen one like that here. I always hated my deep freezer when the stuff I wanted was always buried on the bottom. Shelves would be SO much more convenient! Such a nice wifie indeed lol plain apples were all I ate, when I ate apples. Lucky guy. I have never been treated to a warm breakfast. Ever. Should I be worried now? Good point! Unfortunately, I nearly broke my back the other day (no joke) so I may prefer a good breakfast. I want to get some ham now. This looks so good! Even the girls ate it! I didn't think they would, but you can't go wrong with ham cheese and bagel! Oh those look yummy! Maybe I'll make some for my man and get some brownie points. He'd be shocked, because he's the one who does most of the cooking in our household. LOL! I refuse to let mine cook. He's too messy! That looks phenomenal. That's a full breakfast! I have to try these this weekend. YUM! We go through lots of local honey, and bagels are on my morning-awesome list! These bagels sound amazing! I'm loving those flavors. I'm really going to have to make some! I go through bagel phases too. These would be great for lazy Sunday brunches! This sounds really good. I love Canadian bacon so this would be great! That looks so delicious. I will definitely be making this for breakfast sometime in the near future. Such a perfect breakfast to start a great day! This looks absolutely amazing! This is the quintessential breakfast to start any day- and I love this recipe with your addition of honey-just the perfect amount of sweetness. We are putting this recipe on our must- make list! A touch of salty and sweet! Definitely a snack I can get behind! These look so amazing. I can not wait to give them a try. I love to make my own apple chips. They are so delicious and easy to make. Oh delicious! I have never had Canadian bacon, but maybe it's similar to pork roll? I've never thought to combine this before. I've got to check it out! Oh yummy, what a fun way to dress up a bagel. My favorite way to use apples is to make homemade apple sauce with some cinnamon. Mornings are hard. I normally grab something on my way out the door. 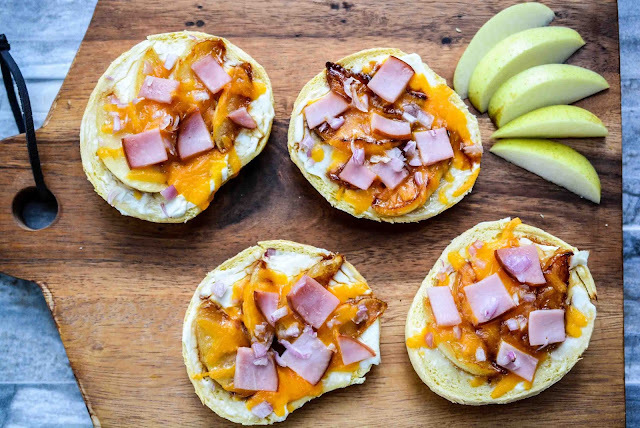 I would love to swap out our boring breakfast for something extra special like these bagels. On on the days I don't get out of bed, I'll just make them for lunch. YUM! Apples on a bagel. Thats a new concept but I can dig it! This looks delicious! I make a sandwich with turkey, bacon, apple slices and cheese and then I toast it and it's fabulous, but I bet it's even better on a bagel!